John Street is named for John Haberdinck (or Harperding), a wealthy Dutch-era shoemaker who owned the land the street passes through. 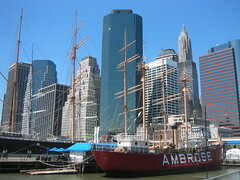 Dey Street's namesake is Dirck Thomas Dey, whose farm (leased in 1677) extended from near Broadway to the Hudson. The street was cut through the farm in 1763 to provide access to a new ferry service to what's now Jersey City. Here was the nine-story Commodities Exchange Building, destroyed in the September 11 attacks. The northernmost part of the site, north of Cortlandt Street, is said to be the future site of WTC Tower 3 (175 Greenwich). Richard Rogers' design is for an 80-story building with 2.8 million square feet of office space. It could open as early as 2015--if developer Larry Silverstein can find a tenant willing to commit to 400,000 square feet, which seems increasingly unlikely. Was the nine-story Dean Witter Building, destroyed in the September 11 attacks. 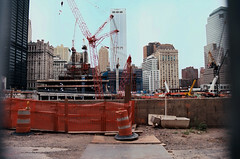 On this site the Port Authority is currently constructing the WTC Transportation Hub, a permanent replacement for the PATH station destroyed in the attacks. (PATH = Port Authority Trans Hudson, the separate subway system connecting New York and New Jersey.) The design, by Santiago Calatrava, features 150-foot glass-and-steel wings that are supposed to bring natural light down to the rail platforms. The new station, which is to include a connection to the New York City subway system, is not scheduled to open before 2014 at the earliest. Corner (22 Cortlandt): This is the mecca of discount shopping in New York City, where hard-core bargain-hunters elbow each other in pursuit of marked-down designer goods. Founded in Brooklyn in 1961. It was one of the first major businesses to reopen after the September 11 attacks, surviving with its attitude intact. Corner (189 Broadway): A two-story building from 1940, demolished 2008, housed New York Stocking Exchange, Cookie Island, World of Golf. 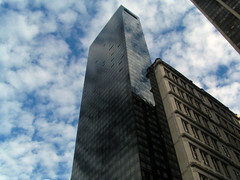 Corner (55 Church): This hotel, opened in 1992 (as the Millenium) and reopened in 2003 after heavy damage from the September 11 attacks, is designed to resemble the black monolith from 2001. The spelling variant (one N rather than two) is said to be intentional. The hotel bar is called Liquid Assets. Corner (195 Broadway): Designed by William Wells Bosworth in 1917 for what was then as much or more Telegraph as Telephone. The building, patterned after the Septizodium in Rome, is said to have more classical columns than any building in the world, and more marble than any other New York building. The bronze decorative elements are by Paul Manship. Previously the site of Western Union's headquarters, which, as one of the city's tallest buildings, had a ball on the roof that was dropped every day at noon, upon a signal from the Naval Observatory in Washington. Ships in the harbor set their chronometers by it, and pedestrians their watches. The ball that drops in Times Square on New Year's pays tribute to this tradition. Corner (192 Broadway): Renaissance Jewelers is in the Corbin Building, an 1880s Queen Anne structure with cast-iron bay windows. In 1864, at this address, Ebenezer and Ellen Butterick pioneered the marketing of paper patterns for making clothes. 15-21: The address of one of New York's first theaters, opened in 1767. Built of wood and described as "an unslightly object, painted red," it saw the premiere of Royall Tyler's The Contrast, the first comedy written by a playwright born in America. (The Contrast introduced the character of Brother Jonathan, a stereotypical Yankee who later became a model for Uncle Sam.) President George Washington used to attend performances regularly, where he was greeted with "Hail Columbia." 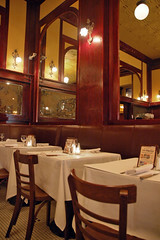 15: French steakhouse owned and operated by celebrity chef Anthony Bourdain. The name evokes Paris's central wholesale market. 17: The Irish American Pub & Restaurant is downstairs here, in the space that used to be The John Street Bar & Grill. On January 19, 1770, members of the Sons of Liberty surrounded 20 or so British soldiers who hand been posting handbills denouncing the patriotic group as "enemies of society" and mocking the Liberty Pole in City Hall Park that the Redcoats had cut down two days earlier. More British troops arrived to rescue their comrades, but not without serious injuries on both sides, in what is considered by some the first fighting of the American Revolution. (Some sources say that there was one fatality, on the American side, but you'd think the name of the first person killed in the revolution would be remembered.) The incident is known as the Battle of Golden Hill, after a nearby wheat field. Corner (56 Nassau): A 27-story building from 1986. 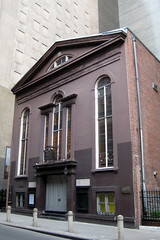 44: The original Wesley Chapel on this site was dedicated in 1768, making this the oldest Methodist church in America. The current building, the congregation's third structure here, was built in 1840. 60-66 (corner): A 16-story building from 1929, designed by Clinton & Russell, houses the city's financial offices. 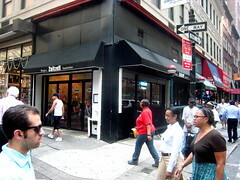 Corner (72 Nassau): Ashkans Fashions; Zaitzeff Burgers are reputed to be among the best in the city. The three-story building dates to 1930. 45 (corner): A 14-story office building from 1908, coverted to condos a full century later. 55 (corner): Seventeen stories built c. 1900; owned by Educational Housing Services and leased to Pace University for student housing. 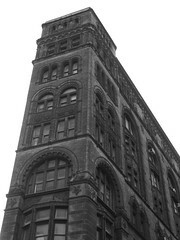 59 (corner): A 13-story office building from 1909, converted to condos in 2006 and now known as Five Nine John Lofts. 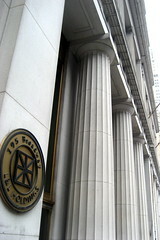 Corner (100 William): Offices of the webhost NYI. 80 (corner): Twenty-six stories built in 1927, now a condo building known as The South Star. 81 (corner): This was the address of J.L. Haiger, who in 1877 became the first telephone customer in the city; a half-mile of wire strung over the half-finished Brooklyn Bridge connected his offices here to his wire factory in Brooklyn. 87 (corner): A 14-story building from 1926. 90-100 (corner): A commercial building from 1931, converted into condos in 1998 and redubbed The Renaissance. Includes the bar Libations 101 and a branch of Crunch Fitness. 116 (corner): A 35-story Art Deco office building from 1931, designed by Louis Allen Abramson and Charles Glaser. Converted to condos in 2010. 99 (block): The Great American Insurance Company Building, a 1933 Art Deco building designed by Shreve, Lamb and Harmon. Jubilee Marketplace on the ground floor. 111 (block): The Insurance Building, 26 stories from 1929. Cafe Gusto on ground floor. 130 (block): A 24-story office building from 1970, also known as 180 Water Street. 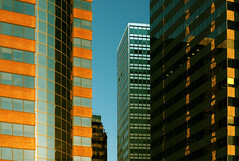 Occupied by the city's Human Resources Administration until it relocates to WTC 4. 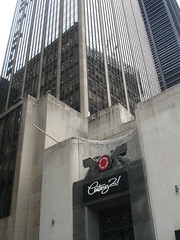 127 (corner): A 1971 31-story International Style office building designed by Emery Roth & Sons. 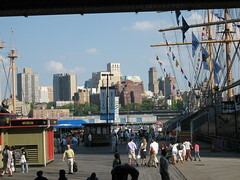 Converted to residences in 1997; for a time it was NYU at the Seaport, the college's largest dorm until it was closed in 2009. Plaza Deli is on the ground floor. Block (175 Water): This 1983 30-story office building, designed by Fox & Fowle Architects, was built for the National Westminster Bank. It later served as offices for the American International Group, becoming a backdrop for the financial crisis that AIG was at the center of. Excavation for this building uncovered the 82-foot hull of a merchant frigate built c. 1715 in Virginia or the Carolinas. The bow of the ship is now housed at the Mariner's Museum in Newport News, Virginia. Block (199 Water): A 35-story office tower from 1983, designed by Swanke Hayden Connell & Partners with two contrasting facades. The building houses offices for Guardian Life, Prudential and other financial firms, as well as the Downtown branch of the TKTS reduced-price theater admissions service. The Europa Cafe is on the ground floor. The last block of John Street is also named "Burling Slip," the name it bore when it was an inlet of the harbor used to unload shipping for the Burling merchant family. 170: The Ships Chandlery is an 1845 building converted into condos. On the ground floor is George O'Neill's Yankee Clipper, a seafood restaurant with Off-Track Betting on site. 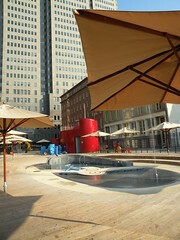 Playground designed by David Rockwell that encourages children to "create a play space of their own with sand, water and loose parts...giant foam blocks, mats, wagons, fabric, and crates." A historic district that became a museum complex in 1967 and was reimagined as an upscale shopping/tourist experience. 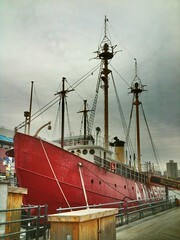 It's the epitome of the kind of place actual New Yorkers don't go to, but its collection of antique sailing ships is really very impressive. 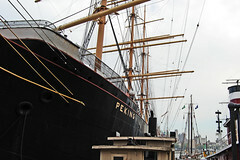 The center of the Seaport's collection of vintage ship, the starboard side of the pier features the four-master Peking, a 1911 giant, while the 1908 light ship Ambrose is on the port side. What am I missing on John Street? Write to Jim Naureckas and tell him about it.